Acute sprains and strains may impede performance and delay return to a sport. Proper management, treatment, and prevention is essential to recovering effectively. An athlete must first understand the definition and recognize the differences between a “sprain” and a “strain.” A sprain is defined as a violent overstretching of one or more ligaments in a joint. A sprain can result in pain, tenderness, swelling or bruising at the joint. 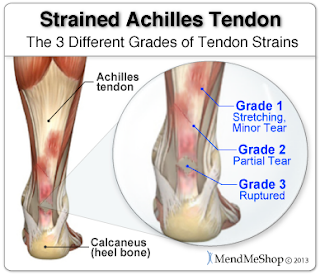 A strain is defined as a stress or direct injury to the muscle or tendon. A strain may also cause pain when moving or stretching the injured muscle, but can also cause muscle spasms. 2) ICE: Sudden cold may help constrict capillaries and blood vessels to slow or restrict internal bleeding. Place an ice pack between a towel or dry cloth. 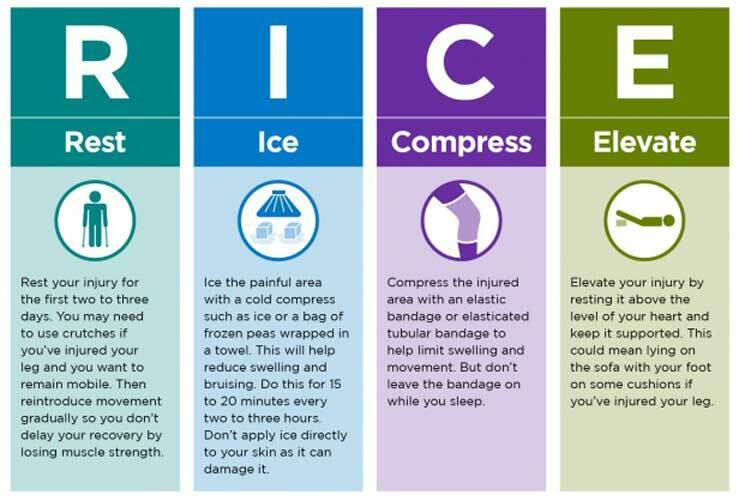 Apply ice every hour for 10 to 20 minutes at a time. 3) COMPRESS: Compression can help reduce swelling post-injury. Wrap the injured part firmly with an elasticized bandage, compression sleeve, or a cloth. Do NOT wrap the cloth too tightly as it may cut off blood circulation and lead to more swelling. 4) ELEVATE: Elevate the injured part about level of the heart to reduce swelling and pain. Place a soft object such as a pillow or piece of clothing to use as a prop below the body part. 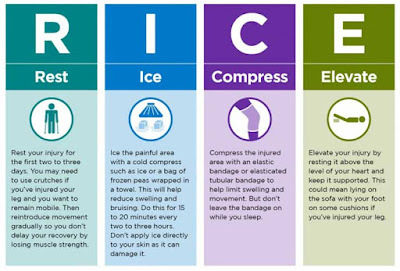 Continue to follow the above RICE method for two to three days post-injury. Daily stretching may help loosen the muscle. Key to prevention is to stretch the tight muscles and strengthen the weak muscles.